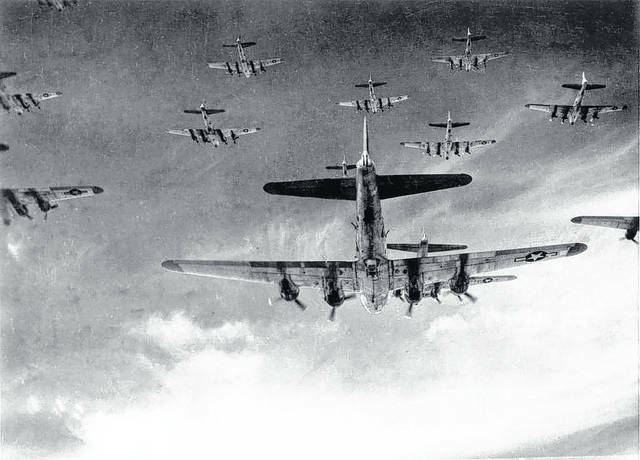 A group of B-17s flying to war. A public domain photo from Wikimedia Commons. 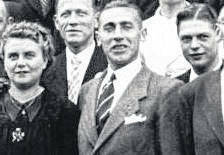 Pictured from bottom left to right Louisa Huyge, Frans Franckx, Albert Van der Auwera (grandfather of Glenny Van der Auwera). Frans and Louisa were Albert’s aunt and uncle. GALLIA COUNTY — Across miles of ocean and decades of time, a Belgian woman searches for American families whose histories are tied intrinsically to hers through a story of danger, sacrifice and eventually freedom. Glenny Van der Auwera, of Mechelen, Belgium, contacted Gallipolis City Commissioner Tony Gallagher, Nov. 24, for information pertaining to Richard Dabney, a former Gallia resident, who died in Gallipolis, March 25, 1981, and is now reportedly buried in Vinton Memorial Cemetery. Gallagher confirmed with the Gallia Health Department that Dabney did die in Gallia and once lived at 10 Grape Street, Gallipolis, according to Dabney’s death certificate. Dabney, and James Ernest Bennett, a second lieutenant, were part of a Flying Fortress flight crew, a Boeing B-17, nicknamed ‘Princess Pat,’ and part of the USAAF Bomber Group, 334 Bomber Squadron. Dabney served as a sergeant and operated radio equipment. While flying missions against the Nazis in World War II, their plane was brought down on December 22, 1943, according to www.evasioncomete.org, near Drenthe in the Netherlands. After surviving the initial crash, the Americans were quickly taken into the care of Arend Otten and Johannes Van Aalderen and kept safe by an organization called Comet Line, a resistance group in both France and Belgium. According to Van der Auwera’s family history, her great-uncle and aunt, Louise Huyge and Frans Francx, fostered the Americans in Belgium after they were transported by a Marie Dumont-Plessix there. The American airmen met with another American by the name of Charles Emil Zesch, a sergeant. Eventually, they were all captured by the Sicherheitzpolitzei, a German security force. Van der Auwera said her grandfather told her the Germans were tipped off to the Americans’ presence due to a “betrayal within the family.” The airmen stayed with the family until June 21, 1944 when all were discovered and taken into custody. The Nazis imprisoned the foster family, Louise Huyge and Frans Francx, in concentration camps. The Americans were kept in POW camps. Lousie and Frans were first imprisoned at Antwerp before being shuffled to other camps. According to Van der Auwera, they were released from the last camps on May 5, 1945 and April 15, 1945, respectively. Bennett, Dabney and Zesch were kept in the Stalag Luft 4 camp. Bennet also spent time in Stalag Luft 1. All survived to the end of the war. Van der Auwera says she has established contact with Becky Bennett, a daughter-in-law of James Bennett. Her research has also revealed that Zesch wrote a book about his time as a POW during the war but so far the Belgian woman has been unable to attain a copy. Van der Auwera went on to say because of her family’s stories, she took a large interest in history and genealogy. Gallagher continues his efforts researching the story along with Van der Auwera. https://www.mydailytribune.com/wp-content/uploads/sites/42/2017/12/web1_Flying-Fortress-3.jpgA group of B-17s flying to war. A public domain photo from Wikimedia Commons.